Indoor air pollution may alter human skin. A study that was recently published in Scientific Reports shows that volatile organic compounds target the cellular mechanism that eliminates damaged proteins. The study uses Genoskin’s NativeSkin® model to study the effects of indoor air pollution on human skin and may significantly contribute to understanding skin aging mechanisms. 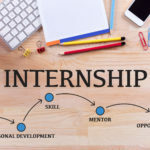 The study was conducted by Anne-Laure Bulteau from the Institute of Functional Genomics in Lyon (Institut de génomique fonctionnelle) in Lyon and Sylvie Lacombe from the Institute of Analytical Sciences and Physical Chemistry for the Environment and Materials (Institut des sciences analytiques et de physico-chimie pour l’environnement et les matériaux) in collaboration with Carine Nizard from the LVMH Research Department. 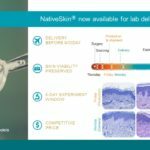 Genoskin participated in the study by providing NativeSkin® study models as well as histology analyses and immunofluorescence staining procedures. The human skin is the most important exchange barrier between the human organism and the outside world. Skin tissue has a complex structure and gradually responds to environmental stress by showing signs of erythema, inflammation, eczema, premature aging or by developing cancerous tumors. As the NativeSkin® model contains the entire human skin structure and is maintained alive for 7 days, this model provides an excellent tool to study skin response to indoor air pollution. With the collaboration of Mickael Le Bechec of the French National Center for Research (IE CNRS), the research team exposed keratinocytes and NativeSkin® human skin models to stable concentrations of volatile organic compounds (VOC) to simulate indoor air pollution (acetaldehyde, formaldehyde, acetone, hexane and toluenes). The team also paid special attention to the gas mixture to reflect chronic exposure. 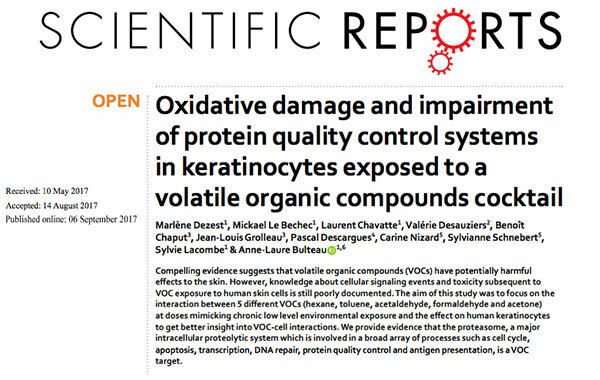 The study shows that exposure to VOC entails a significant decrease in the cell survival rates of both keratinocytes and skin cells. Repeated exposure significantly alters the mechanism that eliminates cellular proteins and generates oxidative stress, which leads to DNA and protein damage and alters mitochondrial respiration. 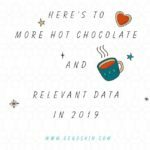 The new data obtained through this study may have interesting implications in understanding the mechanisms of cellular aging. The above text is based on an article from the CNRS website. 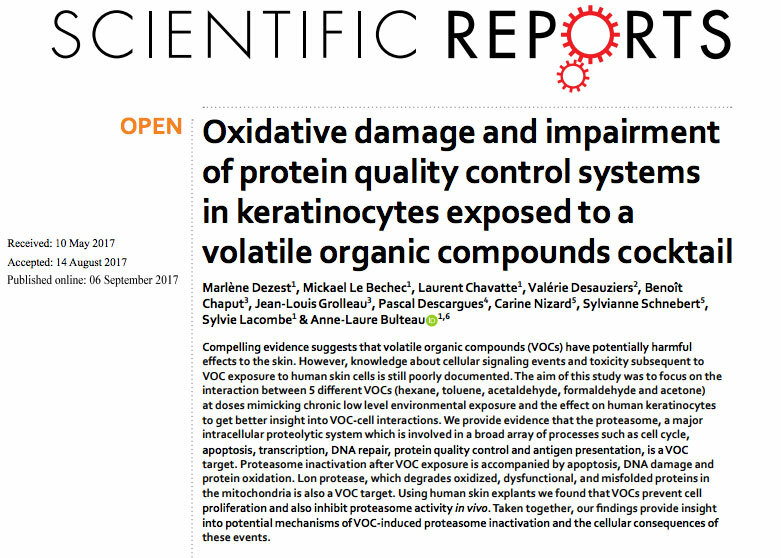 Oxidative damage and impairment of protein quality control systems in keratinocytes exposed to a volatile organic compounds cocktail. Dezest M, Le Bechec M, Chavatte L, Desauziers V, Chaput B, Grolleau JL, Descargues P, Nizard C, Schnebert S, Lacombe S, Bulteau AL. Sci Rep. 2017 Sep 6;7(1):10707. doi: 10.1038/s41598-017-11088-1. Compelling evidence suggests that volatile organic compounds (VOCs) have potentially harmful effects to the skin. However, knowledge about cellular signaling events and toxicity subsequent to VOC exposure to human skin cells is still poorly documented. 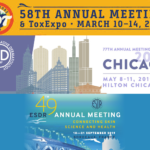 The aim of this study was to focus on the interaction between 5 different VOCs (hexane, toluene, acetaldehyde, formaldehyde and acetone) at doses mimicking chronic low level environmental exposure and the effect on human keratinocytes to get better insight into VOC-cell interactions. We provide evidence that the proteasome, a major intracellular proteolytic system which is involved in a broad array of processes such as cell cycle, apoptosis, transcription, DNA repair, protein quality control and antigen presentation, is a VOC target. Proteasome inactivation after VOC exposure is accompanied by apoptosis, DNA damage and protein oxidation. Lon protease, which degrades oxidized, dysfunctional, and misfolded proteins in the mitochondria is also a VOC target. Using human skin explants we found that VOCs prevent cell proliferation and also inhibit proteasome activity in vivo. Taken together, our findings provide insight into potential mechanisms of VOC-induced proteasome inactivation and the cellular consequences of these events. Should you like to keep up to date on Genoskin’s activities and studies, don’t hesitate to subscribe to our newsletter.